Mahatma Gandhi ~ Amazing ..!! Mahatma Gandhi, a name which doesn’t need any sort of introduction to any of the Indian. He is the person who turned the evil foreigners to humans with a simple smile and strikes in peace. 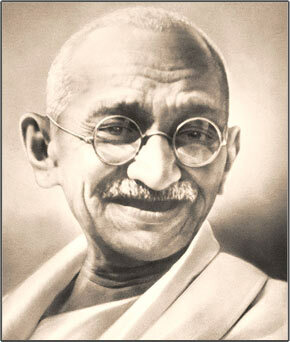 His full name is Mohandas karamchand Gandhi and born on Oct 2nd,1869 at Porbandar. His father Karamchand Gandhi was the Diwan (Prime Minister) of Porbandar. Gandhi's mother Putlibai was a pious lady and under her tutelage Gandhi imbibed various principles of Hinduism at an early age. In 1883, all of 13 and still in high school, Gandhi was married to Kasturbai as per the prevailing Hindu customs. For a person of such extraordinary visionary zeal and resilience, Mahatma Gandhi was by and large an average student in school and was of a shy disposition. After completing his college education, at his family's insistence Gandhi left for England on September 4, 1888 to study law at University College, London. During his tenure in London, Mohandas Gandhi strictly observed abstinence from meat and alcohol as per his mother's wishes. Upon completion of his law degree in 1891, Gandhi returned to India and tried to set up a legal practice but could not achieve any success. In 1893, when an Indian firm in South Africa offered him the post of legal adviser Gandhi was only too happy to oblige and he set sail for South Africa. This decision alone changed the life of Gandhi, and with that, the destiny of an entire nation. As he descended in South Africa, Gandhi was left appalled at the rampant racial discrimination against Indians and blacks by the European whites. Soon Gandhi found himself at the receiving end of such abuse and he vowed to take up the cudgels on behalf of the Indian community. He organized the expatriate Indians and protested against the injustices meted out by the African government. After years of disobedience and non-violent protests, the South African government finally conceded to Gandhi's demands and an agreement to this effect was signed in 1914. A battle was won, but Gandhi realized the war that was to be waged against the British awaits his arrival in India. He returned to India the next year. After reaching India, Gandhi traveled across the length and breadth of the country to witness first hand the atrocities of the British regime. He soon founded the Satyagraha Ashram and successfully employed the principles of Satyagraha in uniting the peasants of Kheda and Champaran against the government. After this victory Gandhi was bestowed the title of Bapu and Mahatma and his fame spread far and wide. In 1921, Mahatma Gandhi called for the non-cooperation movement against the British Government with the sole object of attaining Swaraj or independence for India. Even though the movement achieved roaring success all over the country, the incident of mob violence in Chauri Chaura, Uttar Pradesh forced Gandhi to call off the mass disobedience movement. Consequent to this, Mahatma Gandhi took a hiatus from active politics and instead indulged in social reforms. The year 1930 saw Gandhi's return to the fore of Indian freedom movement and on March 12, 1930 he launched the historic Dandi March to protest against the tax on salt. The Dandi March soon metamorphosed into a huge civil disobedience movement. The Second World War broke out in 1939 and as the British might began to wane, Gandhi called for the Quit India movement on August 8, 1942. Post World War, the Labour Party came to power in England and the new government assured the Indian leadership of imminent independence. The Cabinet Mission sent by the British government proposed for the bifurcation of India along communal lines which Gandhi vehemently protested. But eventually he had to relent and on the eve of independence thousands lost their lives in communal riots. Gandhi urged for communal harmony and worked tirelessly to promote unity among the Hindus and Muslims. But Mahatma's act of benevolence angered Hindu fundamentalists and on January 13, 1948 he was assassinated by Hindu fanatic Nathuram Godse.